prep up the ingredients for the upma – finely chop 1 medium sized onion, 1 to 2 green chillies and ½ inch ginger and some coriander leaves. also take the 8 to 10 curry leaves, 10 to 12 cashews, 1 tsp chana dal and 1 tsp urad dal. heat a pan or kadai first. add 1 cup rava or cream of wheat. begin to roast the rava. stir often while roasting the rava. the rava or sooji grains should become fragrant and start to look dry, separate and crisp. don’t brown the rava. in a pan, heat 2 tbsp ghee or oil. add 1 tsp mustard seeds. when you hear the crackling sound of mustard seeds, it means they are getting fried. now add the ½ tsp cumin seeds along with 1 tsp chana dal and 1 tsp urad dal. then swtich off the flame. here the rava is cooked and the upma is ready. lastly add about 2 tbsp chopped coriander leaves. stir well. 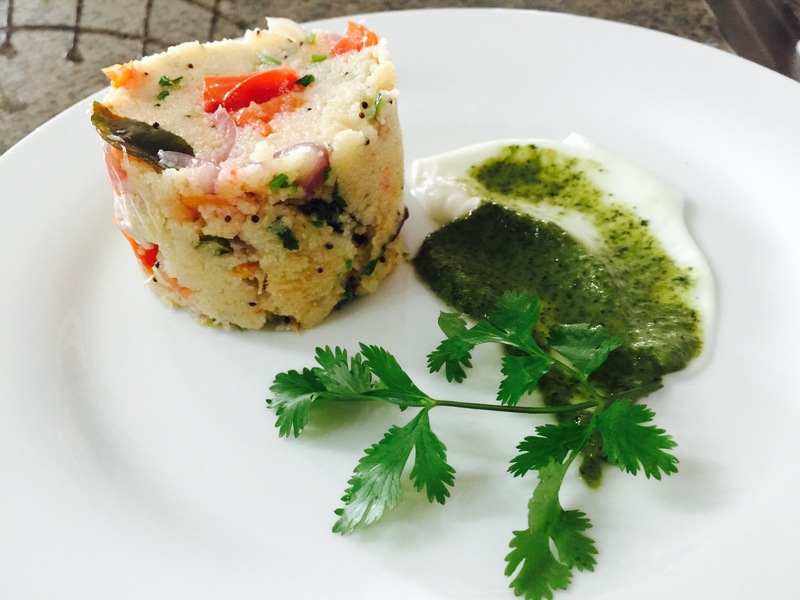 serve upma with coconut chutney or lime slices or lime pickle. immediately then add cashews and begin to fry. by the time, the cashews get golden the dals would also get golden. now add the finely chopped onions. saute the onions till they become translucent. then add the chopped green chilly, ginger, curry leaves. saute for a minute. then add 2.5 cups water to this mixture. add salt as required. then add sugar. sugar is optional and you can skip it. we prefer a slight sweet taste in the upma and hence we add it. stir well. on a medium to high flame, heat the water and let it come to a to a rolling boiling. when the water comes to a rolling boil, lower the flame to its lowest. then add the rava in 4 to 5 batches with a spoon. once you add the rava, stir immediately. then add the next batch of rava. stir again. this way keep on adding and stirring the rava up to the last batch.